Grinder pumps are used in wastewater applications to grind the sewage waste into a fine slurry, preventing blockage of the pump impeller and drainage system. Available models include 1HP residential and larger (up to 2HP) commercial grinder pumps. 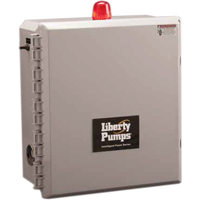 Liberty Pumps OmniVore PRG (residential) and LSG, LSGX (commercial) series manual and automatic grinder pumps. Indoor and outdoor simplex and duplex control panels, in-basin and remote alarms. 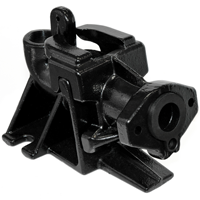 Guide rails, check valves, replacement power cords and other parts and accessories for grinder pumps. A grinder pump is designed to solve the problem of sewage blockage caused by diapers, gloves, food and other articles which clog a typical sewage pump system, resulting in downtime and added maintenance costs. A grinder pump incorporates a sharp, motor-driven blade which grinds the incoming waste into a slurry and allows it to be discharged without obstructing the drainage piping or the pump impeller. 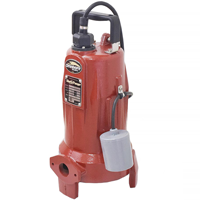 While mostly used in commercial settings, like restaurants, shopping malls and other high-traffic institutions, smaller size grinder pumps can also be used in residential settings in place of traditional sewage pumps. Automatic sewer grinder pump models incorporate a wide angle float switch which turns the pump on or off at designated water levels. Wide angle float is secured by a clamp to the pumps’ body and allows to adjust the length of the unsecured portion of the float to regulate the on/off levels. Manual grinder pumps can be used for manual dewatering of sewage basins and collecting tanks or in combination with alarm/control panels for automatic operation.